We have some good news for Hero Motocorp fanboys out there. Recently we have got our hands on a completely new patented image and from the first look of it, the motorcycle surprisingly is definitely not another regular Commuter that we generally expect from the brand. To begin with, the motorcycle appears to share some of its parts with the Xtreme 200R and soon be launched Xpulse 200. The same stubby looking exhaust, fuel tank, and instrument cluster and even the round headlamps can also be seen on the almost production ready variant of the Xpulse 200 which was showcased at the 2018 Auto Expo and will launch towards this year end. If that is the case then we can certainly inform you that Hero Motocorp is actually planning to introduce a 3rd motorcycle to the 200 cc lineup. It was confirmed by Hero Motocorp officials earlier this year that they are looking to introduce a range of premium motorcycles over the next eighteen months or so to strengthen their position in the premium end market. As promised, Hero already launched the Xtreme200R in India and will soon be introducing the affordable and budget-friendly Xpulse 200. A third 200 cc motorcycle will definitely be a surprising move from their end. However, the big question is what the upcoming 200 cc motorcycle could possibly be, now that they already have a streetfighter and an adventure tourer in the segment? Could this possibly be a performance based version with an uprated engine of Xtreme 200R to rival KTM Duke 200, or a little subtle focussing on the touring aspects like the Yamaha FZ25? 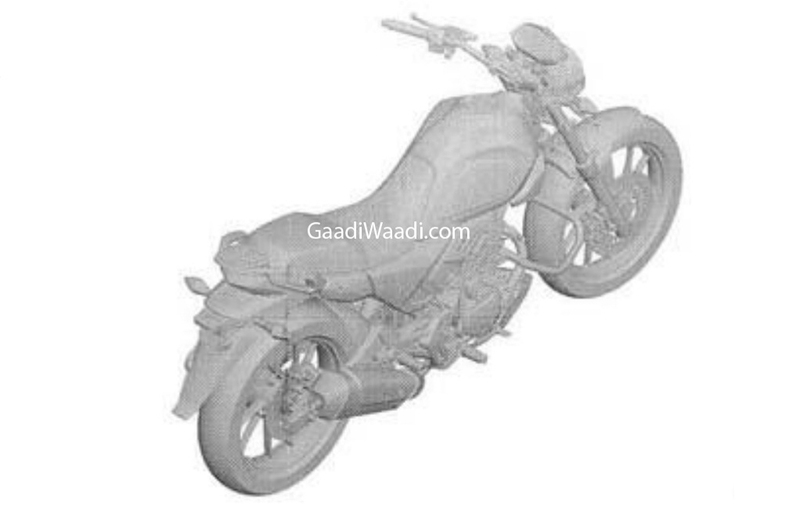 From the first patented image we can certainly tell you that this motorcycle does not look like a Cruiser but from the absence of small fairing towards the front and round headlamps, exposed instrument cluster, chubby exhaust, fatter tyres and minimal body panels towards the rear profile there is a possibility that this could be a Scrambler variant that Hero Motocorp might be working on next. If that is the case then this will definitely be the most affordable Scrambler that you will be able to buy in the Indian market for sure and will be powered by the same 199.6 cc single cylinder air cooled motor generating 18 bhp and 17 Nm of torque output, paired to a 5-speed gearbox. Conventionally speaking, Hero could be trying to develop a 160 cc naked streetfighter as well to compete against TVS Apache RTR 160 and Bajaj Pulsar NS160.